Employability is an online game for students at Canterbury College considering a career in the tourism, care and retail sectors to help them identify and develop desirable behaviours sought by employers. Employers have often complained that young people entered the jobs market with a very poor attitude to work and that this was the single predominant reason why young people were unable to find work or hold down jobs. To help prepare their students for eventual employment Canterbury College commissioned Cyberkix to create an interesting and fun tool that would give young people training about desirable behaviours in given situations they may encounter at work. 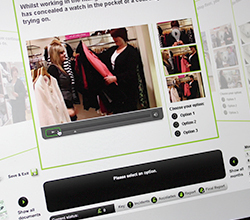 Cyberkix created 3 employability games that focused on the Care, Retail and Tourism sectors. By presenting real life scenarios in video, images and text, players were asked to respond to each situation, thus building up their profile based on their attitude, creativity, relationships and organisational skills. The aim was to raise awareness and understanding of the impact of these behaviours for their employability producing a written report at the end to demonstrate their awareness of the importance of behaviour at work.